This is going to be kind of epically long, guys. But don’t be scared, because this is totally doable. 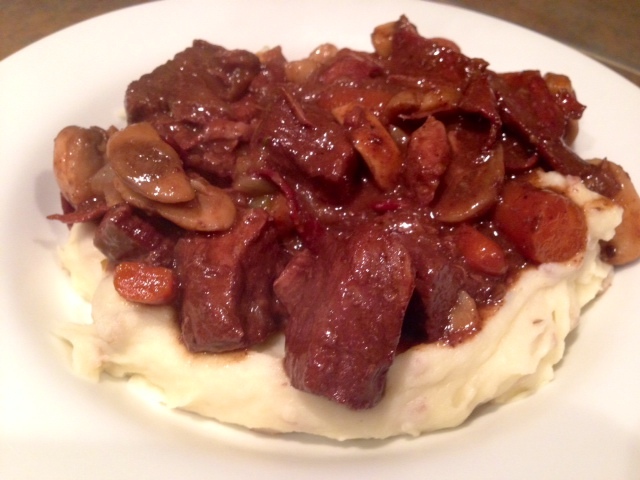 I’ll tell you a not-so-secret: I don’t like roast or stew. Never have. Growing up in the Midwest, with grandparents who raised cattle, I ate a lot of roast with little potatoes and carrots. Even beer or deer roast on occasion. And it just never did it for me. 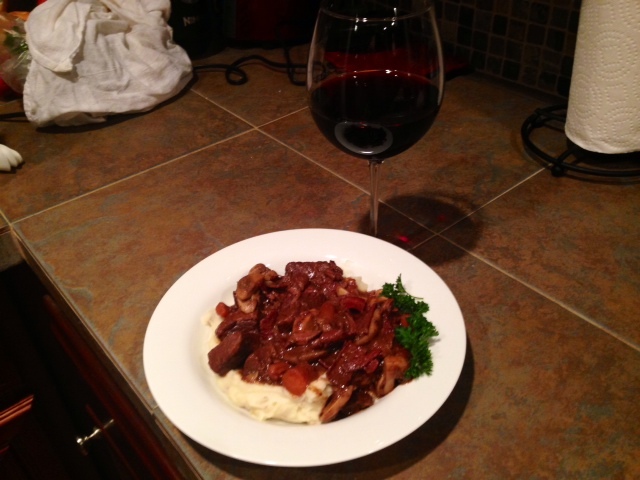 That’s why I’ve never had that same fascination with Julia Child’s boeuf bourguignon that other cooks seem to have. 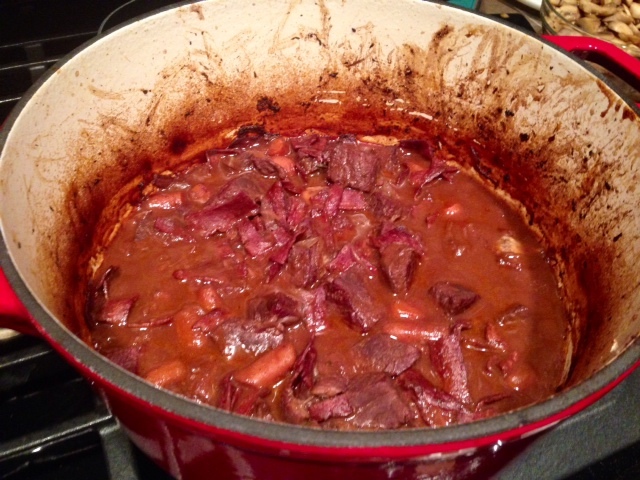 To me looking at it, you put tons of work in and at the end you get…stew?? My mom came into town a couple weekends ago and brought me, among other things, my new car (my hip wasn’t up to 16 hours in the car), apples and potatoes from my grandma’s garden, and a bunch of new steaks and roasts. As I was poking through recipes, looking for something we could attempt together, I kept coming back to Julia Child’s classic dish. For one, I felt like I had to attempt it just from a “legitimate cook” standpoint, plus I have an unholy fear of raw meat, so I figured my mom could help me trim and cut up the roast. So we decided to give it a go. 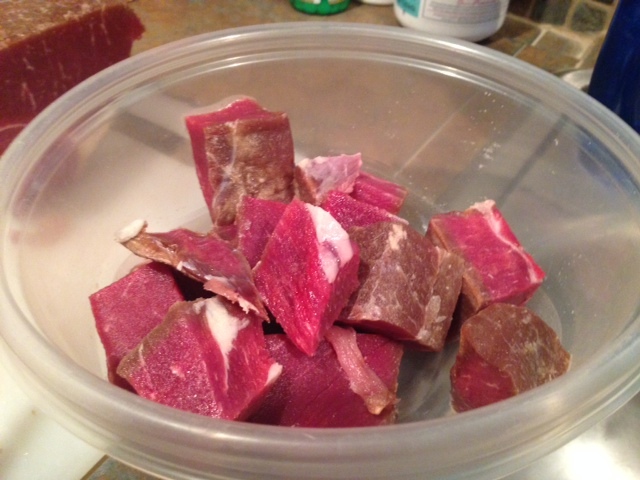 Cut your roast into 2-inch cubes, trimming off the fat and other stuff. How do you say ‘no’ to that face? 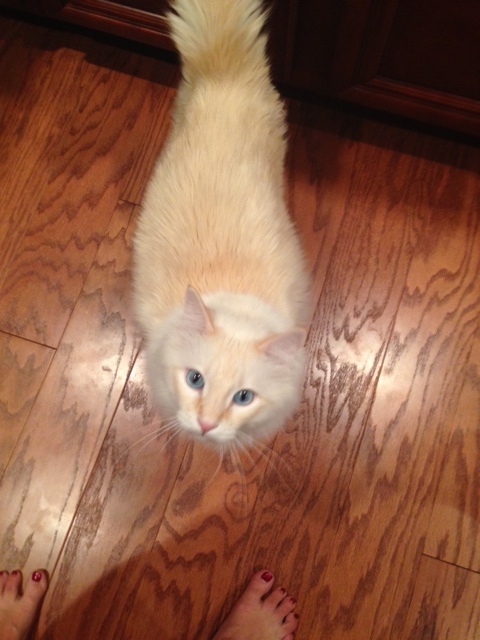 He’s just discovered that he thinks human food is delicious, but doesn’t know how to eat out of your hand without dropping it on the ground. It’s pretty sad (for my floors). 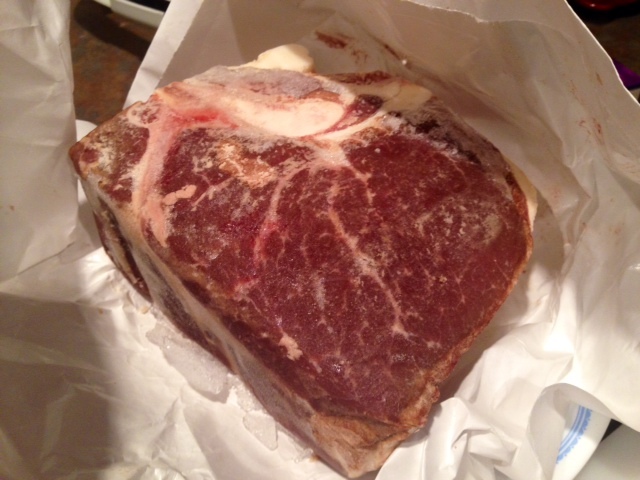 Pat the meat dry carefully with paper towels and preheat your oven to 450ºF. 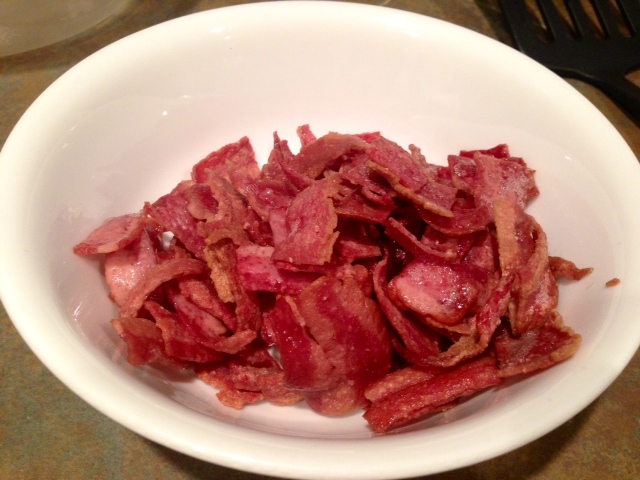 Prepare the bacon by removing the rind and cutting it into lardons (¼ inch thick x ½ inch sticks). 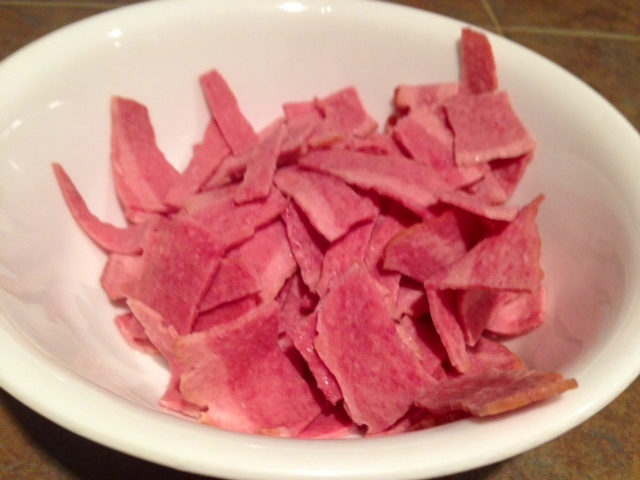 We were using turkey bacon and it just doesn’t have the same effect—or the same chemistry. I might even omit this step next time, or try to get my hands on thick-cut beef bacon. But I’m assuming pig bacon is different. Simmer everything in 4 cups of water for 10 minutes. Drain and dry carefully with paper towels. In an oven-proof casserole or a frying pan (I used my big dutch oven), sauté the lardons (but keep the rind aside) in a tablespoon of extra virgin olive oil for 2-3 minutes until lightly brown. Remove them with a slotted spoon and keep them aside. 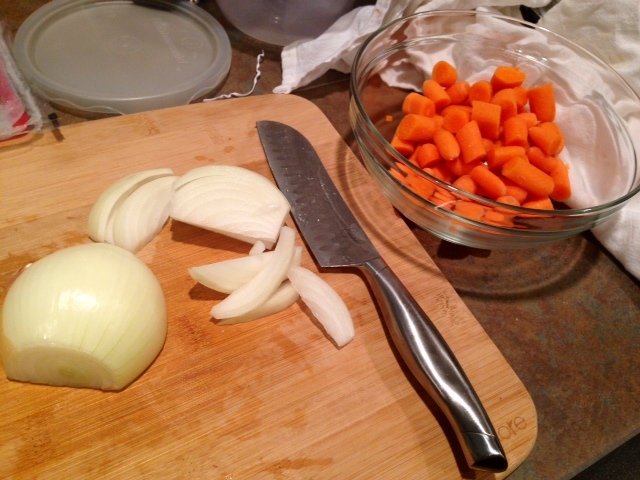 Slice the carrot and julienne the onion, and keep them in a bowl nearby as well—the first parts of this all move pretty quickly once you start cooking. 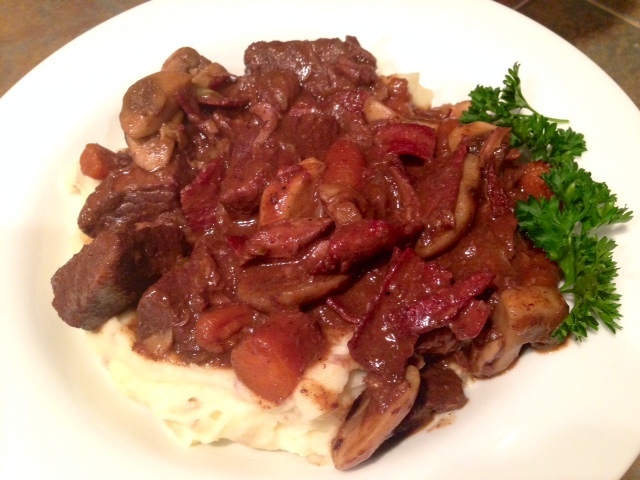 In the same casserole you cooked the bacon in, sauté the beef until golden brown on each side. Remove it and keep it close by. Still in the same casserole, sauté the carrots and the onion until golden brown. That looks pretty amazing. 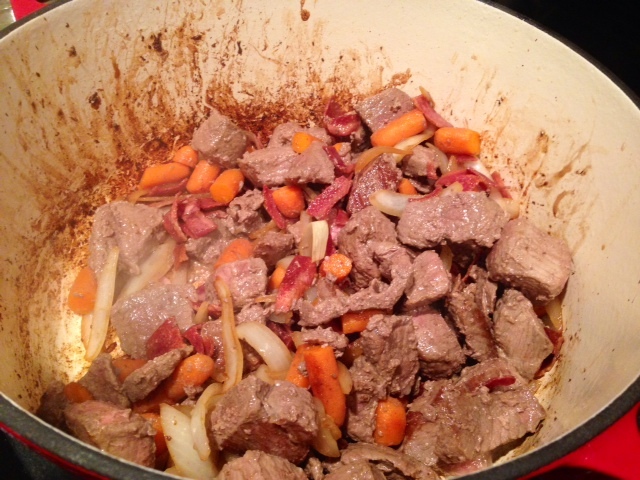 Then add the bacon and the beef back to the dutch oven. Sprinkle with salt and pepper, then add the flour and toss to combine. 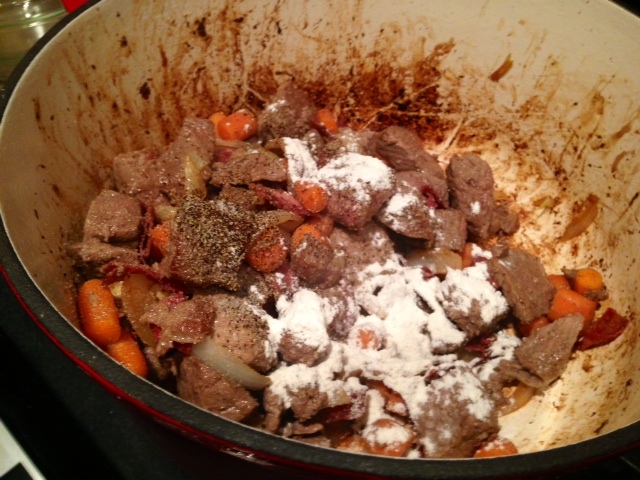 Place the dutch oven uncovered in the middle rack of the oven for 4 minutes, which will give the meat a lovely crust. 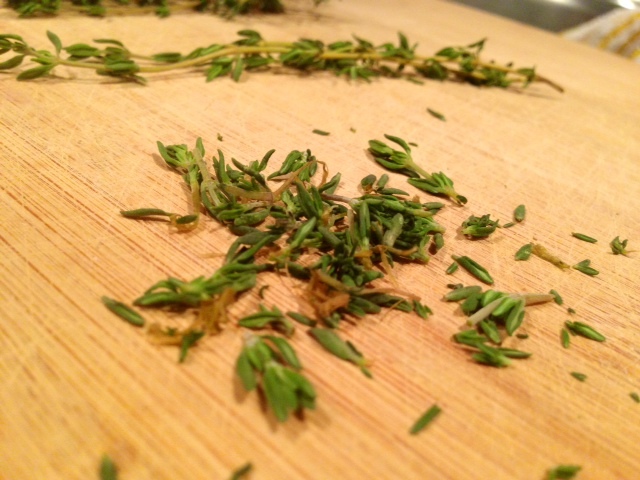 If you haven’t already, now’s a good time to prep some other ingredients, specifically getting your herbs and seasonings together, along with your garlic. Also, opening up your bottle of red wine. Remove the casserole from the oven and turn the oven down to 300 F. The dish will smell great, but you ain’t seen nothing yet. 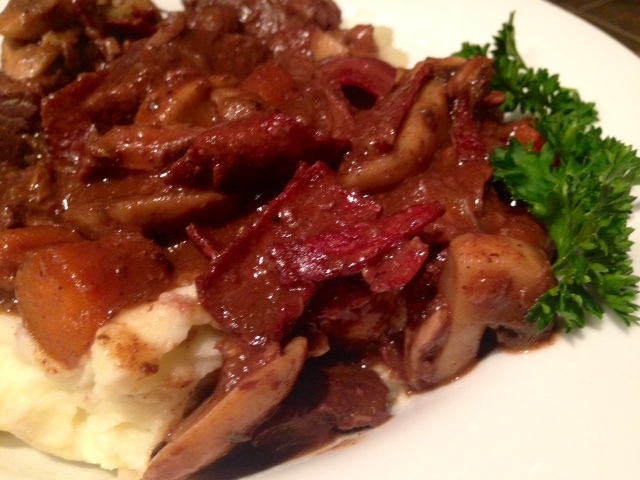 Stir in the wine, stock, tomato paste, mashed garlic cloves, thyme, bay leaf, and blanched bacon rind (if you have it). This is where that chocolate comes in handy. Add a square or two of dark or unsweetened chocolate.Right now your sauce is kind of purple, but the chocolate will give it a nice and deep reddish-brown color. 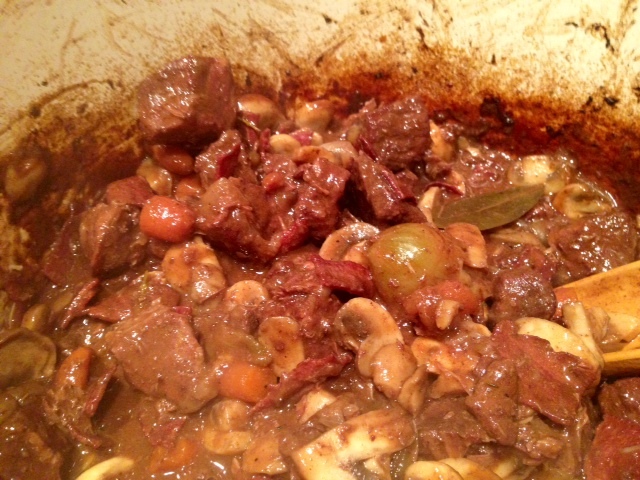 Bring it to simmering on the stove, and make sure (once again) that the big pot you’re using is oven-safe. Cover the pot with a lid, or just stretch aluminum foil over the edges to minimize evaporation and loss of juices. Place it on the lowest rack of the oven (which is at 300 F). Cook for 3-4 hours. While the stew is cooking (probably an hour or so before you’ll pull it out of the oven), prepare the onions and mushrooms. 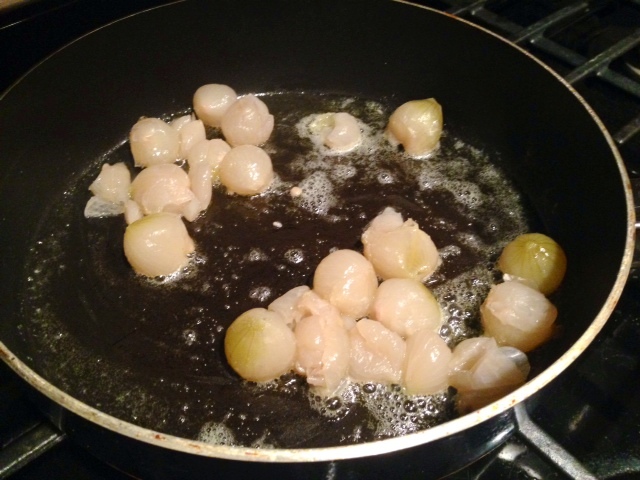 For the onions, melt 1 tablespoon of butter in a frying pan and sauté the peeled onions until golden brown. Add beef stock until they are almost covered, throw in the herb bouquet, and simmer for 20-25 minutes turning them around as they cook, or until almost all the liquid disappears and they are tender but still retain their shape. Set them aside. Pay no attention to how pitiful my onions here look, the grocery store didn’t have pearl onions so I had to use soggy ones from a jar. Feel sorry for me. Once the onions are done, remove them from the pan and melt another 2 tablespoons of butter. 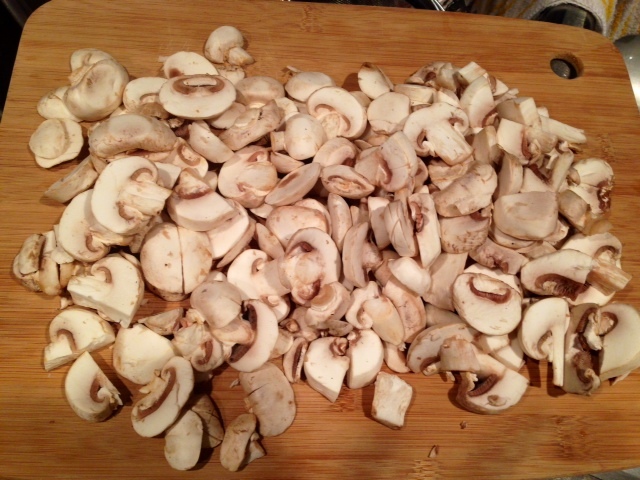 Wash, quarter and sauté the mushrooms, stirring until they are nicely brown. Set them aside as well. Your house should be smelling AMAZEBALLS by now. When the meat is tender, remove it from the oven. It’ll look kind of thick and glazed like this. Put the onions and mushrooms in the casserole and simmer on the stove for 5 minutes. The sauce should be thick enough to coat the back of a spoon. If not, boil it until it thickens. If it’s too thick, stir in some stock or bouillon to make it thinner. Serve over potatoes, pasta, rice, whatever. We used garlic mashed potatoes, but in hindsight regular mashed potatoes would have been fine—the intensity of the sauce negates any other flavors coming through. Eat it while it’s hot (and savor some more red wine…we’ll assume you’ve already killed the first bottle, so open a second). But it’s awesome leftover as well. I ate it for like four more meals. And then pat yourself on the back for attempting one of Julia’s masterpieces and coming out whole on the other side. That’s right, we’re legit. Too legit to quit. Start by preparing the bacon. 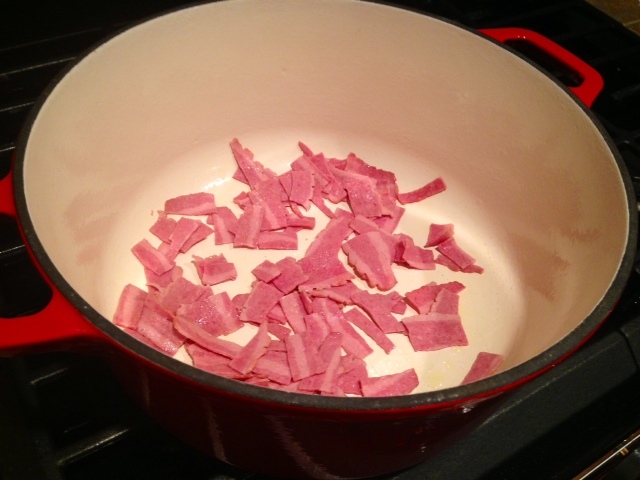 If you’re using pig bacon, remove the rind and cut the bacon into lardons (about 1/4-inch thick by 1/2-inch strips) and simmer everything in 4 cups of water for 10 minutes. Drain and dry carefully with paper towels. 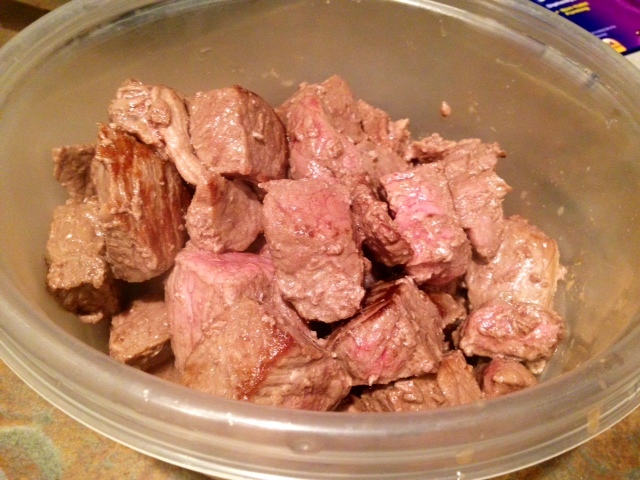 Cut the roast into 2-inch cubes, and dry carefully with paper towels. 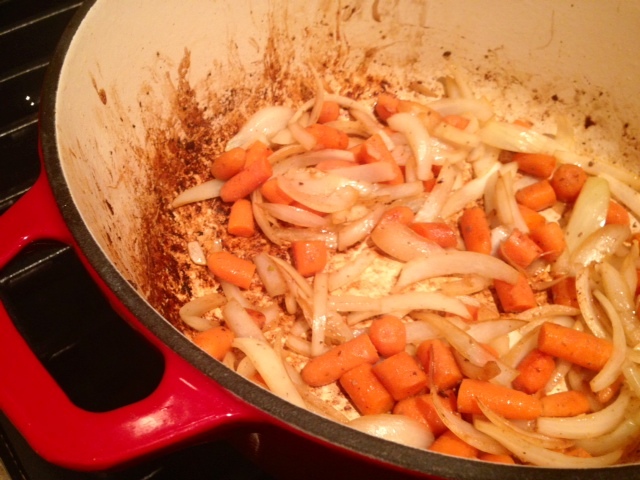 Preheat your oven to 450 F. And slice the carrots and julienne the onions, setting aside in a bowl. In an oven-proof casserole or a frying pan (I used a dutch oven), sauté the lardons in a tablespoon of extra-virgin olive oil for 2-3 minutes until lightly brown (keep the rind aside). Remove them with a slotted spoon and set aside. 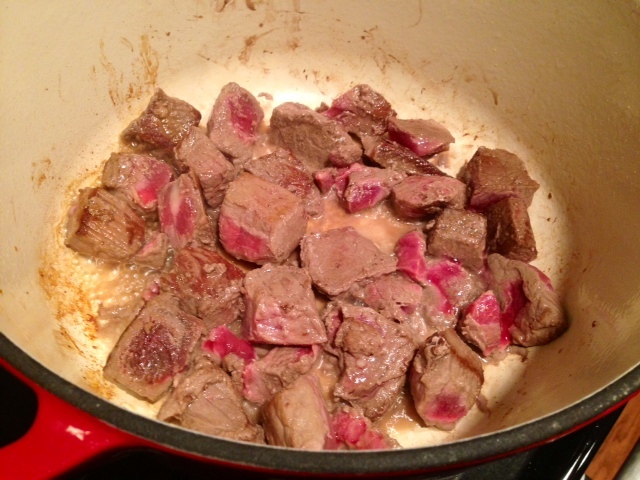 In the same casserole, sauté the beef until golden brown, making sure all sides are seared. Remove it and set aside as well. In the same casserole, sauté the carrots and the onion, until golden brown. 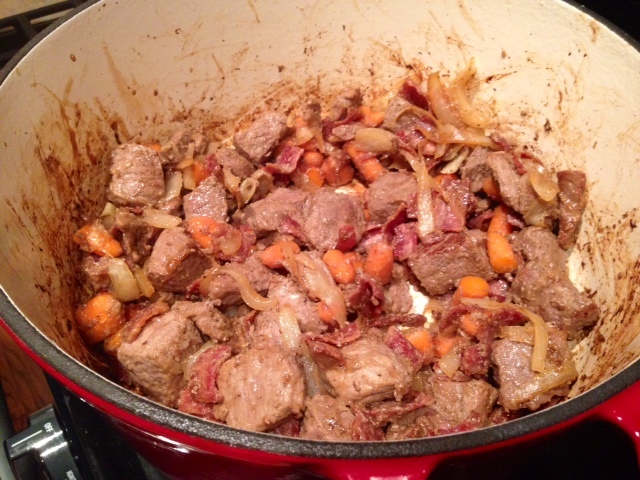 Return the bacon and the beef to the casserole. Sprinkle with salt and pepper, then add the flour and toss to combine. Place the casserole uncovered in the middle rack of the oven for 4 minutes, this gives the meat a nice crust. 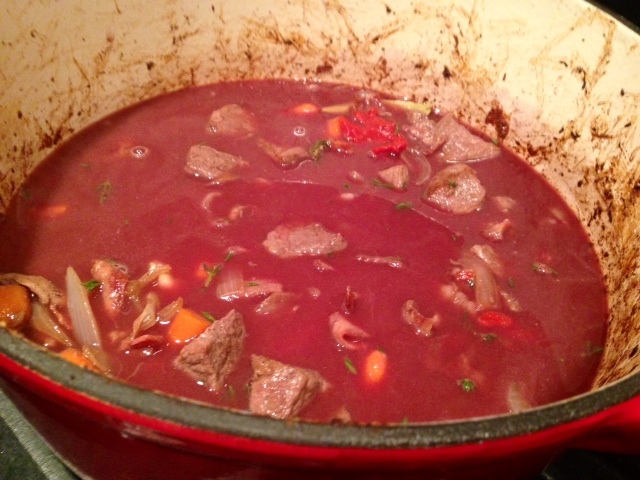 Remove the casserole from the oven and turn it down to 300 F. Stir in the wine, beef stock, tomato paste, mashed garlic cloves, thyme, bay leaf, blanched bacon rind (if you have it), and dark chocolate. I know it sounds crazy, but the chocolate will prevent the sauce from turning purple from the wine and will give it a nice, deep reddish-brown color; it doesn’t affect that taste at all. Bring it to a simmer on the stove. 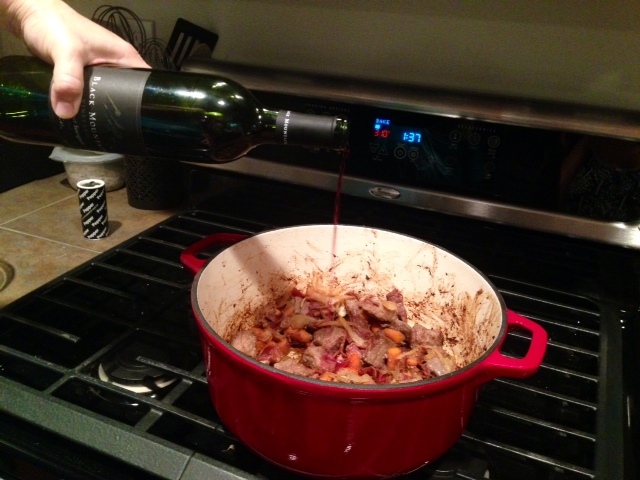 I’m assuming you’re using a big enough pot (that’s oven-safe), but if not, definitely switch to a big pot now. Cover the pot (if your pot doesn’t have a lid, stretch aluminum foil over the edges of the dish to minimize evaporation of juices) and place it on the lowest rack of the oven. If you forgot two paragraphs ago, turn the oven down to 300 F. Cook for 3-4 hours. 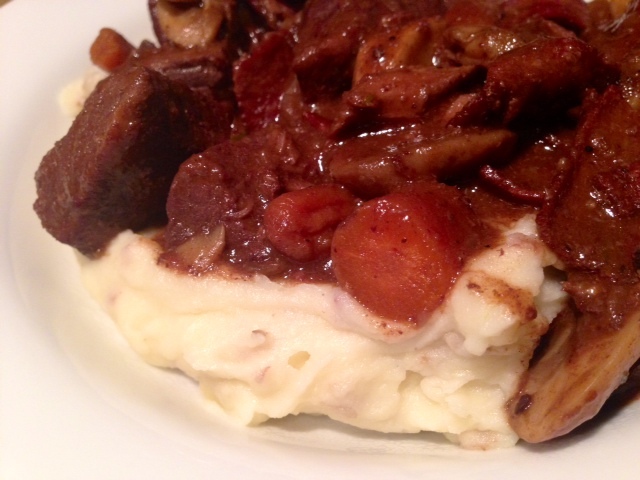 When there’s about an hour left on the stew, get started on the onions and mushrooms. For the onions, melt 1 tablespoon of butter in a frying pan and sauté the peeled onions until they’re golden brown. Add beef stock until they are almost covered and simmer for 20-25 minutes, turning them around as they cook, until almost all of the liquid disappears and they are tender but still retain their shape. Set them aside. 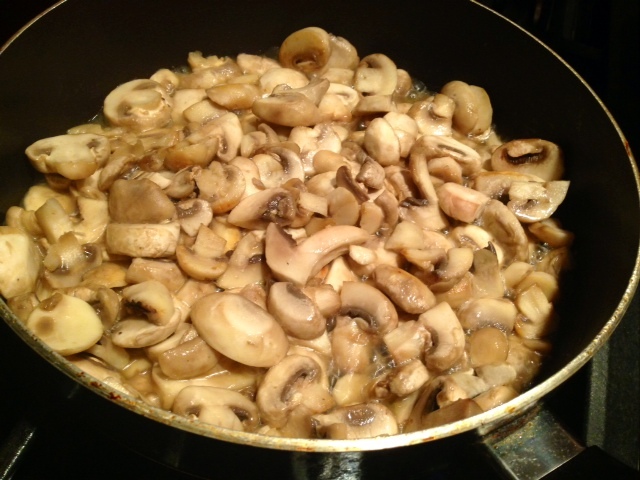 In the same pan (drain any remaining liquid), wash, quarter and sauté the mushrooms in 2 tablespoons of butter., stirring until they are nicely brown. Set them aside as well. When the meat is tender, remove it from the oven. 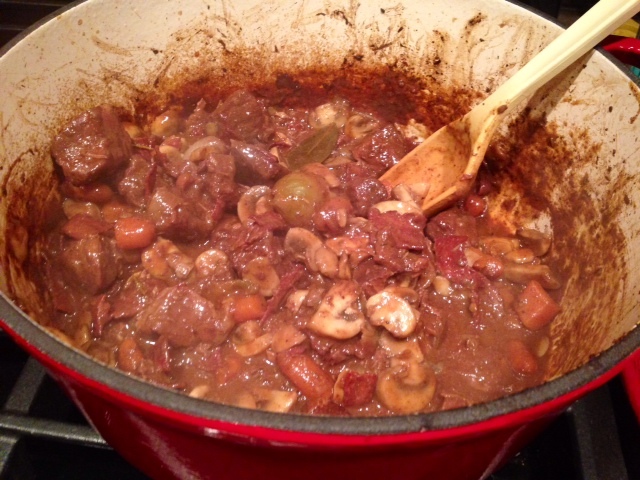 Stir the onions and mushrooms into the stew and simmer on the stove for 5 minutes. The sauce should be thick enough to coat the back of a spoon. If it’s not, you can boil it to thicken it, or if it’s (for some reason) too thick, dilute it with a little stock. 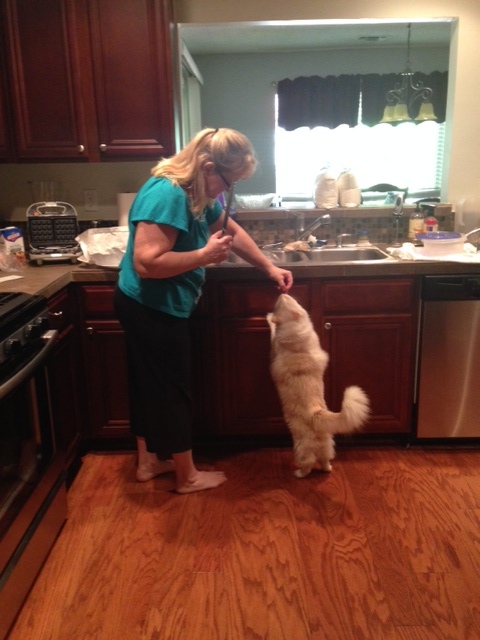 Serve over potatoes, rice, or pasta.